I had a test machine I was setting up this week. 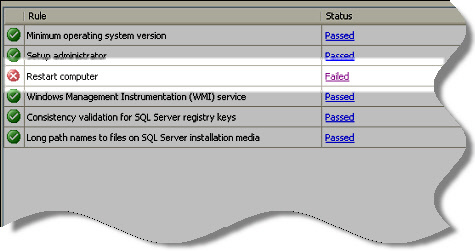 SQL Server 2008 was one of the applications I needed to install. Digging deeper, the true cause of the message was “There are pending file changes. Please reboot”. After 3 reboots and counting, I was still getting this error message. 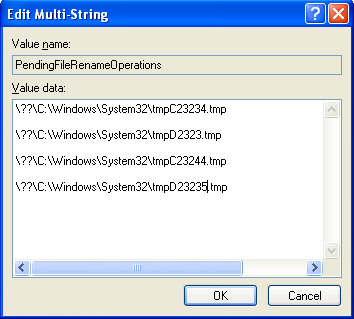 After searching the net, I discovered there is a registry key that Windows uses to move, or delete files on boot. This helps when you have files that are always in use and can only be deleted or renamed when windows has not started up yet. Windows is supposed to scan through it, do its thing, and then clear it out. Many setup programs that look at this key – so it works for more than just SQL Server. Keep in mind, the pending list is there for a reason. Don’t tinker with it unless you have already tried rebooting. I wonder if the preceding “\? ?\” had anything to do with it? Actually – no. That is the format those are supposed to be in.